Or perhaps a folding in half cantilever style pack away method, though that would be harder and take longer to implement (Time is something I have very little of at the moment) And it may also give trouble when joining the Carrera track pieces back together. Has anyone been in a similar situation with space restrictions and Carrera track? And come up with a compact but fun layout? Hoping for some ideas, or even a link to some Carrera space saving layouts? I will need to figure out an account somewhere on the www to host my pics, but don't have time just now. (I was also using google images, but had to stop using it as the permissions settings are a bit too fiddly) I had an image hosting account back in the days of myspace but I'm guessing that will probably no longer be supported. Was thinking of flickr but read an article on lifehacker suggesting its days are numbered... not sure how true that is though. Enjoying the other threads on this forum for now though, its inspiration for a few minutes each day while I'm waiting for an opportunity to set something up as a trial. Here is a layout that I spent ages tweaking... but decided against it due to visibility of all the corners from the driver's position. The esses are designed to be part of the overpass from top right to lower left. There are lots of modifications that can be done to this circuit, if you replace some of the R2's with R1's you can get a longer back straight, but not really much point, unless you already have lots of R1's. I also designed a version that transitioned from R2 to R3 onto the main straight. But found it difficult to source R3 curves, unless I bought a pack of 6. Not much point since I will likely only ever use two of them. This circuit has a nice advantage in that it has equal lane length. You can also substitute the 3 straight pieces in the middle for 4 R1 curves and that is a lot of fun to negotiate with a magless car as I have found from a test build that I did. This is also a bit of a test of the image hosting site weblinks that I generated. So apologies if it does not work all that well at first. Edited by Slotspeed, 06 April 2018 - 07:51 PM. And here is a layout that I like because it would be an easy build (with a raised overpass for the back straight) but it needs crossovers to achieve equal lane length. I'm used to driving through them, but they do somewhat disrupt the flow of the circuit through those sections. I do kind of like the look of this circuit though. Edited by Slotspeed, 06 April 2018 - 08:04 PM. Hey Slotspeed - For some reason these pictures aren't working! I am on the Scalextric digital side - I went with Scalextric because it does take up less space. 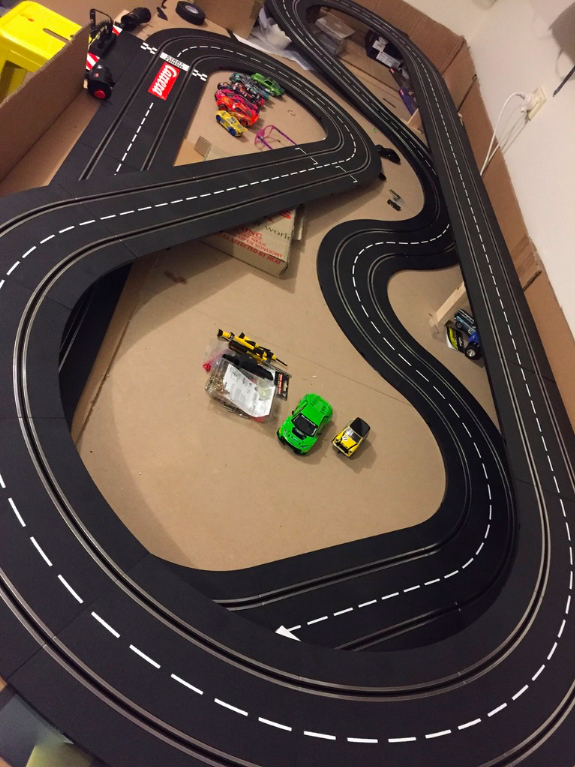 I have a 3.6m x 1.8m table, and I have built a track with 3 decent straights, 2 big sweeping corners and some good technical parts (2 hair pins, some tight turns). I used Ultimate Racer 3.0 to plan out my track, and I made sure both lanes were close to equal length for analog racing. Yes, looks like my links are broken, there were issues with Postimages website, my images have probably been migrated to another web hosting address, will have to see if I can find them. I was restricted on the width, my final layout approx 4.5 feet wide. Sounds like you have quite a nice Scalextric layout. If I was to start over, I think I would go the Scalextric route, plainly because you can buy so much used stuff for quite reasonable cost. I still haven't got the digital side happening, I am having too much fun with analog. I would love to build a three lane routed track one day, I can't see myself needing more than three lanes at home.